Once believed to be “immune privileged” and relatively protected from the effects and influence of the immune system, it is now well established that the brain is capable of mounting inflammatory responses in response to various stimuli. In addition, proteins once believed to be solely expressed in immune organs (and in particular TNF superfamily members and their receptors) have now been demonstrated to have important roles in normal central nervous system (CNS) function. Importantly, cross talk between the brain and the immune system and its regulation are critical determinants of normal central and peripheral nervous system (PNS) physiology and dysregulation of such is believed to underlie a number of chronic neurological disorders. While the role of inflammation in pathological conditions such as multiple sclerosis can be clearly appreciated, there are a number of other CNS and PNS disorders in which the role of the immune system is not well understood yet neuroinflammatory responses appear to be dysregulated and may be contributing to disease progression and neuronal loss. Neurodegenerative diseases such as Alzheimer’s disease and Parkinson’s disease fall within this category and affect a large number of individuals over age 65. 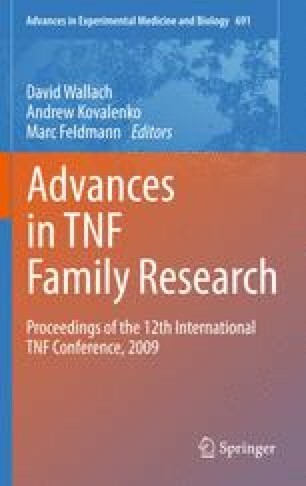 Therefore, investigations aimed at gaining a better understanding of the role of TNF superfamily signaling cascades in normal brain function or in neurological disorders is of high importance and extremely timely in light of the rising number of aging individuals worldwide.